(Copy, paste, and edit as desired. Notice that the following wording does not include the split revenue rate. This is omitted on purpose so they will contact you for more information, and you can then email the Rental Agreement to them which contains the terms of the split, and the many ways they can promote the Well and increase the income for their event. This will establish the context in which the rental rate is considered, and they will become even more excited because they will see what other renters have done that they probably haven't considered yet. You will notice a paragraph offering the Mini-Well toys as an additional way to raise money. If you don't want to provide the toys, you can remove that paragraph. But it is an easy way for you to increase your income without any effort. You can read more about this here. We are excited to announce that we have a Spiral Wishing Well available for charities in this area. If you have an event coming up, we would be happy to rent our Well to you for a share of the coin revenue, so there is no risk to you. Spiral Wishing Wells have raised over $1 billion dollars over the years for organizations around the world, and some of the largest amounts have been raised at one-day or weekend events. The current one-day record is $40,979 at a church in California. Common results are a thousand or more dollars in a day with the Wishing Wells using some of the hints and strategies the manufacturer has developed. 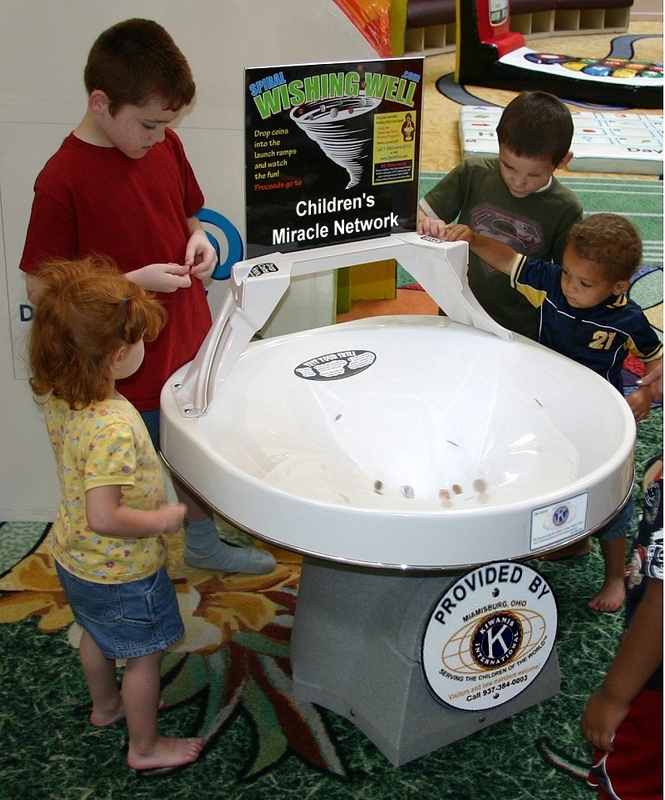 Children (and adults) like to watch coins spin around the vortex-shaped funnel, gaining speed and seeming to defy the laws of gravity as they hug the side-walls without falling over. Steve Divnick, inventor and manufacturer of the devices observes, “Spiral Wishing Wells bring a focus to events, and give the organizers a chance to encourage everyone to bring all the loose coins in their home to the event. There is over $10 billion worth of coins sitting on America’s dressers and under seat cushions. These events get some of that money moving.” You can see pictures and read more about Wells placed around the world, and see movie clips at www.spiralwishingwells.com. Optionally, you can raise additional amounts by offering the small mini-well toy banks "FREE for a $25 or greater donation". The Vortx® toys are great for show-and-tell, birthdays, and Christmas gifts for children. We can provide these to you when you pick up your Well (so no up-front risk), and you only have to pay for the ones you move. You will raise an additional $10 or more for each one. You can read more about the toys on www.spiralwishingwells.com/toy. As you consider ways to increase your fund raising this year, please let us know if you are interested in renting our Well and we will send you some additional information. Rentals will be scheduled on a first-come-first-served basis. Of course, if you want to see it in action, please give us a call and we'll set up a time when you can come take a look. We would love to see you and show you the coin-spinning phenomenon in person. You can see movie clips on www.spiralwishingwells.com.